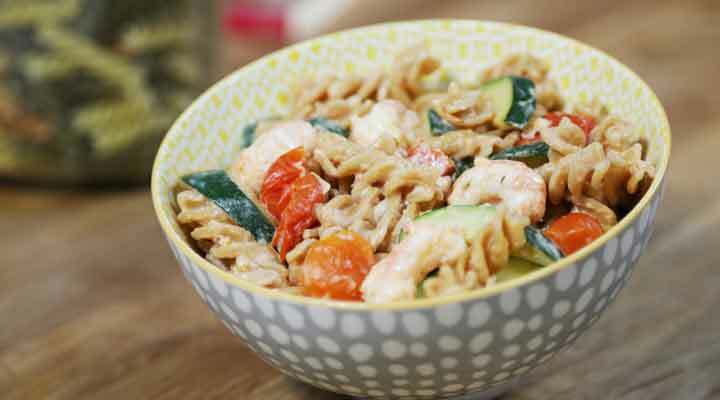 Operation Transformation Recipe - Delicious seafood pasta dish that is ready in minutes. Place olive oil in a pan on medium heat. Add crushed garlic and fry for 1-2 minutes being sure not to let it burn. Add the halved cherry tomatoes and sliced courgettes to the pan and cook until tender. Add the cream cheese to the pan and stir well allowing to melt. Add the prawns to the sauce and allow sauce to simmer until prawns turn pink for approximately 5-10 minutes. Add the cooked pasta to the prawn sauce, mix through and serve.